VOiCEup Berks creates opportunities for people to volunteer, learn and lead in their communities. We strive to provide volunteers with a high-quality experience that fuels further action, and we envision a day when everyone is inspired and equipped to be the change they wish to see in the world. VOiCEup Berks is also an official affiliate of Youth Volunteer Corps. We creating volunteer opportunities to address community needs and to inspire youth for a lifetime commitment to service. For more information, check out our YVC web page! 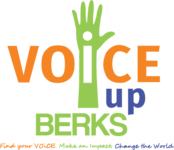 The VOiCEup Berks website provides a link for individuals, families, teams, and corporate groups to join together and engage in meaningful volunteer opportunities throughout Berks County. We strive to promote volunteerism and get people involved in their communities. VOiCEup Berks does this in partnership with other organizations so we are working together to bring about long-lasting change in our communities. From motivating children to discover and learn, to serving hot meals to low income families, to caring for the environment, to large scale transformational projects, residents of Berks County are responding to critical needs. VOiCEup Berks provides screened and supervised activities that serve to build capacity within nonprofit, faith-based, and public organizations. We're about empowering people to make change. Join us…be part of the change! Read news articles about us here. Come out to help YVC build an outdoor classroom at 16th and Haak Elementary School in Reading. Exact time TBD so watch your email! Come support the kids of the Dream League! Saturday, June 15 at 9:15am at the Relevant Sports Complex Baseballtown Charities of Reading sponsors an adaptive baseball field and league, the Dream League, that provides an opportunity for kids with physical and developmental disabilities the chance to experience the magic of baseball and thrill of playing on the diamond through custom-designed, turf fields that accommodate wheelchairs and other assist devices while helping to prevent injuries. The Dream League is looking for groups of 15 volunteers that can work with these special youth during their baseball games this inaugural season. Each child will need one volunteer with them during the game to encourage them, help them, and most importantly keep them safe. Minimum volunteer age with adult is 12 years old. For further information, watch the volunteer video here https://www.youtube.com/watch?v=OAePi9PYhKo . Contact YVC Program Director Lindsay Sites at lindsay@voiceupberks.org to sign up for this opportunity. Come out to Hope Rescue Mission to work in the thrift store and assist in serving lunch from 10am - 1pm on Saturday, June 29th. Contact YVC Program Director Lindsay Sites at lindsay@voiceupberks.org to register. Come to any one of our 11 club locations and spend time enriching the lives of children! Our after-school volunteers will help our club kids with a variety of activities, ranging from homework help to reading to arts and crafts, and a variety of sports activities.